We’ve all heard horror stories about people blindly following their Satnav, such as the Japanese tourists who drove their hire car into the Pacific Ocean, or the woman who drove her £96,000 Mercedes into the River Sence despite the clear warnings that the road was unsuitable for motor vehicles. Mistakes like these can be costly, but for the majority of us who like to use our common sense a GPS tracking system can be a great money saving tool. Nobody enjoys getting lost, especially when you’ve had to pay for the fuel to help you get lost in the first place; and the primary job of a Satnav is to get you safely to your destination. This is especially useful for people who spend a lot of time driving to destinations they may be unfamiliar with, such as builders or sales reps. By avoiding getting lost you not only save time, but you use less fuel. Research into this area found that drivers using a Satnav saved 12% on fuel costs compared to their counterparts who had no support from a GPS. Using the route planner feature on your Satnav can also teach you new routes to familiar destinations; by reducing the distance you travel everyday by a mile will save over 350 miles worth of fuel a year, which your wallet and engine will both be grateful for. Conversely using a GPS to find a longer, yet quite route, will reduce the amount of time sat in stationary traffic by an estimated 35%. Spending a significant amount of time in an idle car can actually be derogatory for a car’s engine and increase fuel consumption; and remember having the engine running in a stationary car gets zero miles to the gallon. So finding a route that is slightly longer but avoids any standing traffic can be an easy way to save money. Speeding fines, like speed cameras, can often come out of the blue. When driving in an unfamiliar location it is all too easy to drift over the local speed limit, especially if you are trying to navigate without the use of a GPS. One lapse of concentration can not only lead to a £60 fine, but also three points on your licence which can be even more costly in the long run. Insurers will hike premiums if the driver has points on their licence, and the possibility of losing your licence will put a very serious financial burden over your head as many employers require their staff to hold a valid driving licence. Most Satnavs now come with speed camera alerts giving you ample time to check your speed and make sure you haven’t wandered over the speed limit; some Satnavs will also alert you to which roads the police use for mobile cameras. In addition lots of Satnavs will alert you to the speed limit of the road being travelled on and alert you if you are exceeding the speed limit. The majority of GPS devices come with a list of local amenities, so if you’re in an unfamiliar setting they can find the nearest garage, hotel or restaurant. Getting directions to these amenities can save fuel and is safer as it prevents you from being both the pilot and navigator, leaving you to give the road your full attention. To sum up, Satnavs not only make driving safer and more enjoyable, but they also make journeys easier to plan and reduce the chances of getting lost. Saving money on fuel is one major benefit of this better planning, and avoiding speed cameras is an added bonus. 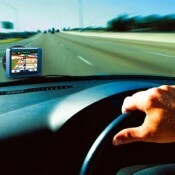 With these thoughts in mind a Satnav can quickly pay for itself and save you money in the long run too. This was a guest post on behalf of Teletrac a company specialising in vehicle tracking and fleet management technology.